The first step to starting your home-based business is knowing what kind of business you can do, and make sure you enjoy doing it. ​​Ideally, you should find a business that has little competition but a large marketing audience; so do some research and find out. Be sure to slow down and plan out as many details as you can. You'll be glad you did once you begin to reap the benefits of working from home. 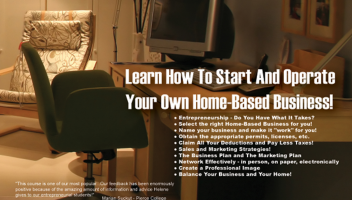 Starting a home-based business can be challenging Some people know what type of business they want to do from day one while some need to explore their options. If you are one of the lucky ones who has already settled on your calling, your journey is only beginning. For those who are still searching, I’ve outlined these 5 steps. They are also relevant for people who’ve just started to check if you made the right choice. Here is what you need to know: 1. Start with what you know Use your current skills to build your business. Perhaps it is what you are already doing in your current job or something you are doing for fun. This helps because you already understand the work itself and the industry you are in. Starting and running a business you know nothing about will be difficult. You’re in an unknown territory. You have to learn about the business, the marketplace and the competition. It takes a longer process to be successful because there is a huge learning curve to overcome. 2. Pick what you enjoy doing for little reward Many of my clients ask me to recommend a home-based business they can start. I always decline because I don’t know enough about what they know and can do. If I tell them to be a bookkeeper and they have no affinity with numbers, that won’t help at all. Instead, I try to guide them by asking the right questions and getting them to answer honestly. What can you do well? Do you like doing it? If your current job is what you want to go into, how would you do it differently? Do you think you can do this full-time for the next 5, 10, or 20 years? Money may be hard to come by when you first start a business. Think of what you would enjoy doing for little or no reward. This is important to help you to distinguish between a passion or a hobby. I often hear from people that they want to start two home-based businesses at the same time… and I always answer with a no! Running a business takes time, money and effort, so you will be spreading yourself thin by trying to get things going for both businesses. You really need to focus – concentrate on what you are doing and apply every minute of the day towards meeting your goals to get your business off the ground. 3. Find a niche and build a business around it Your business idea may not generate enough income for you. After all, you might like to paint seascapes and are good at it but how many seascapes will people buy? Or the business you pick might have many competitors in the market. It is better to find a need in your community and fill that void. I have also found that a service-based business is typically more successful than a product-based business. 4. Do your homework The more time you spend in researching the type of home-based business you want to start, the higher your chance to succeed. The first thing to do is to research the competition: What do they sell? How is it similar or different from what you want to do? Where and how are people buying a similar service/product that you want to offer? Where is this competition located – local, city-wide, state-wide, country-wide or global? Why are people buying from them – price, quality, style, reputation? Look at their website. What do you like or dislike? As you compile this information, think things through. How would you do things differently and do you really think you can compete effectively to earn a decent living? 5. What’s your hurry? You’ve waited this long, so don’t jump in without giving this new journey the attention it needs. Take the time to plan, plan, and plan. Use the internet, read books, take a class, talk to other business owners and write everything down. Make notes about what you have written – good and bad. Making the wrong decision will set you back even further because you will end up unhappy, find it hard to succeed, and you will always remember it as a failed effort. I’ve found that running a home-based business is an amazing way to earn a living: it gives you a sense of freedom and independence to do what you want to do, whenever you want to do it. To get there, you must prepare for it. All the steps you take in organizing and shaping your business is the wisest and most important thing any entrepreneur can do. It is an investment in yourself. Working from home is one of the joys of today’s advanced technologies. Not so long ago, the majority of employees and entrepreneurs were chained to a desk regardless of the type of work they do. Now, it’s a different story. 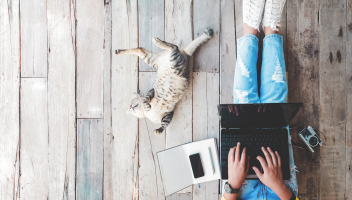 A study released in May 2018 from workspace provider IWG found that 70% of professionals work remotely at least one day in a week, while 53% work remotely for at least half of the week. But while the need for a physical office has declined in favour of alternative work spaces - including the home, hot-desk arrangements or third place environments - business owners still need certain elements of an office to streamline business operations and maintain professionalism. That’s where a virtual office comes in. Virtually the same as an office... minus the actual office Thanks to Wi-Fi, secure networks and mobile technology, most business owners can work from anywhere without blowing their budget renting an office, especially when they’re frequently out on the road meeting clients or networking. But they may still need a physical location that acts as their headquarters that provides a local presence, a place to receive and store mail and to hold occasional meetings. If you haven’t heard of virtual offices before, think of it this way: you get virtually everything you would find in a regular office rental, such as a place to receive and store mail and a receptionist to answer calls, minus the physical office. If you do need a physical office occasionally, say once a week, you can turn up and use the facilities by the hour. The same goes for meeting rooms. A virtual office offers key components of physical spaces, but for far less money and, usually, less commitment too. For instance, a virtual office and a physical office both provide: A place to hold meetings and to work A commercial address for business mails A registered company address (that’s not the client’s home) An address to put on business cards and marketing materials A local presence in a specific city, or area, associated with the client’s target market On-site services such as printing, faxing, copying and other administrative services, such as receptionist or secretarial support As such, virtual offices are on-demand and cost-effective solutions, which are often more closely aligned with the organization’s day-to-day needs. Operating as a collection of on-demand resources, a virtual office is as permanent or as fluid as needed by its users. Because of this flexibility and shared resources, it dramatically cuts down the capital expenses that are associated with typical office infrastructures. What are the benefits of using a virtual office? For small business owners and home-based professionals, the biggest benefits of a virtual office are the low cost and flexibility. They also help small business owners to look more professional and save time by streamlining business operations. Here’s how: 1. Credibility - having a professional address gives a business the upper hand over competition that doesn’t and sets those all-important first impressions. Given the choice between a finance business using a home address, and a competing firm with a corporate address at say, 48 Wall Street, which one looks more professional? 2. Support - virtual offices provide receptionists, mail redelivery services, and other business support services. For small business owners juggling everything from sales and marketing to invoicing, having someone pick up the phone or greet clients on your behalf saves a lot of valuable time. 3. Customer service - having an on-hand receptionist to deal with queries improves the customer service of a business. When you’re busy running a business, or you’re working from home and the kids are home from school, it makes a much better impression if your calls are handled by a professional receptionist who has the time and the customer service skills, to handle calls in a friendly and professional manner. 4. A professional meeting place - having a professional, physical space to meet with clients sends out a completely different message compared to meeting up with prospects in a cafe or at home. If you’re meeting with a client over a sensitive matter, or a potential investor to talk through your numbers, you need a quiet, private meeting space that’s well-serviced and comes with relevant presentation or conferencing equipment. 5 ways you should use a virtual office Now that you know why businesses use virtual offices, let’s look at the 5 most popular ways to use them: 1. As a commercial address and mail forwarding service Every basic virtual office plan includes a business address and mail handling services. This means mail is received by on-site staff, sorted, stored for collection or forwarded to the location of your choice. 2. As a registered company address This means you can switch your registered company address from your home to your virtual office’s business address. If you decide to do this, it’s worth using a registered agent that can accept important legal business documents. This means you’ll be notified immediately if any important mail comes in that needs your urgent attention (e.g. a letter from the secretary of state or a legal document). 3. To provide a “local” feel This is important if you’re breaking into new markets or you want to attract more clients in a specific location. Signing up for a virtual office in a certain area gives your business a local feel as well as the chance to meet clients on-site. 4. For meetings or to get work done Even though we call it a virtual office, it’s still a bricks-and-mortar building. Most virtual office buildings have meeting rooms and office suites that can be leased by the hour or by the day. 5. To improve customer service A live receptionist service, which is available as an add-on service from most virtual office providers, ensures that incoming calls are answered by professional receptionist staff. Calls are either patched through to your cell phone or messages are taken and forwarded to you. Either way your clients and callers get great customer service, which reflects well on your business. Whether you’re looking to grow your business and expand into new markets, or simply manage your time a little better and improve your customer service, a virtual office can provide an excellent low-cost, flexible workplace solution for businesses at any stage of the growth journey. Every home-based business starts with a dream. As an owner, it’s your responsibility to take care of that dream and convert it into a flourishing business. Therefore, never allow the following six misconceptions in the path of your home business. 1. Most Home Businesses Fail If you start with a negative mindset from the beginning that home businesses are not meant for achieving success, then you are succumbing to a pre-meditated conception without even trying for it. It’s not an encouraging sign if you look at the stats of home business failures on the internet. But then, the failures have mostly occurred due to lack of experience and expertise, and to an extent due to the varying market conditions faced by the business owners. However, these challenges should not deter you. Always remember, by planning carefully along with a passion and zeal to succeed, you would receive all that it takes to realize your dream.2. Need to Devote All Your Time Like all other businesses, your home business too demands some quality time from you for its survival and growth. However, it is important to use time wisely. Devote two to three hours in the initial phase and see the progress. Based on its rate of development, you should be the best judge to decide whether it requires more attention from your end. It is always advisable to start on a small-scale; when the business enters into the expansion mode, increase your hours in order to take it to a whole new level.3. Need a Healthy Startup Capital Some home businesses call for a good amount of money at the time of their launch. On the other hand, a service-oriented or a consulting startup demands a very small amount of capital from you. Some other independent home businesses just require a personal computer and a telephone to get started. So make an in-depth research on your own in order to cut the startup capital as much as possible.4. Need Plenty of Experience There is no denying to the fact that prior experience always comes handy at the time of running your business. But experience is not everything. As long as you have a good business brain, and you are prepared to treat your mistakes as a learning curve, things would be just fine for you. You can pick up any sales modules, pricing modules, or accounting modules to update yourself with the latest trends and changes. Moreover, there are quite a few organizations, which offer programs on free mentoring. So, there’s absolutely no end to learning! 5. Success Takes Many Years It is important to realize that success cannot be achieved overnight. This truth is applicable to all professions, spheres, and businesses. So, it is absolutely vital to remain patient with your home-based business. In this context, it is important to have a set concept on the yardstick of your success. If earning an additional income is your main objective, then success can be achieved within a very short span of time. But if you desire to make the earnings through your home business as the primary source of income, then it is absolutely crucial to work hard and experiment cleverly. Make no mistake, like all other forms of businesses, it would eventually experience the taste of success in the end.6. Unexpected Tax Consequences Earnings generated through your home business automatically become taxable. However, you always have the option of taking away qualified expenses for reducing the taxable income. Insurances, licenses, mileages, equipments used for the purpose of your business, accounting software, etc. come within the purview of qualified expenses. So, take them into account, and plan accordingly to avoid any unexpected tax consequences. Author Bio Michael Evans is a writer and a passionate photographer. He is currently associated with IstosGlobal Corporate services . Busy, busy, busy. If there's one thing we can say for certain these days, it's everybody is extremely busy. The real question though is not how busy you are but how much you're actually getting done. We all have the same 24 hours available to us each day but have you ever noticed how some people seem to get a lot more things actually signed, sealed and delivered in that time? Other people, by stark contrast, seem to be stuck flailing through a seemingly never-ending series of minor, low-value tasks no matter how much time is available to them. We've probably all found ourselves in the unhappy position of simply running to stand still at some stage or another. Left untackled, it's a scenario that can seriously sap morale and cripple your ability to perform. Once those tasks start to really pile up, it's all too easy for a minor rut to turn into a full-blown ongoing slump. So, how do productive people avoid this trap? How do those lucky few seem to clock in at 9 and out at 5.30, a full day of completed work happily behind them, with a song in their heart and a smile on their face? The reality is that productive people approach lifeÂ in a fundamentally different way than the average person. They do different things, think different thoughts, cultivate different habits and, as a result, live radically different lives in terms of their output and overall mental equilibrium. With a view to significantly upping your game, we've put together six key things that truly productive people do on a daily basis for you to learn from so that you can boost your daily productivity. Start working them into your routine and you'll be amazed how much more quickly your various wheels start turning. 1. Don't Make Moods Your Master Pick up the average productivity book and you'll find an endless series of "hacks" or "tactics" to employ -- all of which promise to shave a few crucial minutes off your day here and there. In fairness, many of these tactics actually work. Use them wisely and you'll be able to carve out potentially significant amounts of extra time for yourself over the course of the average working week. The unfortunate truth though is that if you're not managing your internal emotional landscape on an active, ongoing basis. There is not a tool or trick in the world that can really deliver game-changing results. Left unchecked, your emotions and default reactions are more than capable of sabotaging even the best laid plans. Cultivating a calm, non-reactive outlook is the single greatest boost you can give to your capacity for actually getting things done. It's the difference that will make the difference across every area of your working life over time. There are many paths towards cultivating this sense of calmness and not falling victim to the default churn of your emotions. Cognitive behavioural therapy will be the route for some, others will naturally lean towards mindfulness or meditation to help tame their thoughts and acquire a wider perspective. Whichever solution you end up plumping for, the point is that you need to be establishing some sort of mental practice to put you firmly in control of your moods and emotions rather than the other way around. By regularly working on this skill - a skill which can be learned like any other â€“ you give any of the techniques we're about to move on to a much greater chance to work their magic. 2. Put Email On A Schedule Let's perform a simple thought experiment. Pick a person you admire in a business context. It could be someone in your organisation or a well-known industry name. Maybe it's Zuckerberg, maybe it's Alice over in Accounting. Now imagine that person sitting down to work of a morning. Five minutes in, there's a knock on the door and someone they've never seen before runs into the room and dumps a huge load of urgent papers on their desk before storming out without a word. Ten minutes later, three random employees enter the room without knocking and begin conducting a heated argument about a series of obscure topics for half an hour. Variations on these events recur at completely unpredictable intervals throughout the day. Is this how you imagine successful, productive people go about their business on a daily basis? Is this the type of endless interruption and context switching your chosen person would tolerate? Of course not! Yet by taking an unscheduled approach to email and letting it dominate your working day, that's exactly the situation you're willingly putting yourself into. Email is a tool - nothing more. And, like any tool, there are good and bad ways of using it. The two most important rules to incorporate into your daily routine are the following: Don't check your email first thing in the morning. Only check your email on a fixed schedule. The mere thought of trying either of these ideas will be anathema to many people but the productivity gains on offer are enormous. By checking email first thing in the morning, you are effectively handing total control of your working day over to anybody who's taken the time to send you a message. Get into the habit of tackling some real work first thing in the morning before you even look at your email and you'll be amazed at how much more gets done during the entire day. Having specific times where you check and process your email puts you back in control of your hourly schedule, clears up significant amounts of uninterrupted time to work and sets an appropriate level of expectation for those contacting you. The amount of time wasted in the average office on mindlessly checking and re-checking email inboxes is truly staggering. Introduce some order to your approach to email and you instantly set yourself apart. 3. Not Everything Has To Be Done One of the great curses of modern life is the idea that everything is important, that every piece of the never-ending stream of input we are faced with is something to be processed and somehow dealt with. The key to any sort of sane attempt at being productive is somehow turning this flood into a manageable trickle. Your time is valuable and limited and you need to draw hard lines in terms of what will actually occupy any of your available bandwidth. To put it simply, the first question you should ask yourself about any potential task that crosses your desk is not how will I do this? The first question should be do I have to do this at all? Make sure you're taking the small bit of extra time it requires to actually assess whether each potential task is necessary before diving in and you'll start to quickly see your daily workload diminish as your output increases. 4. Distractions Have To Go As humans, we are unbelievably prone to distraction. Depending on who you believe, there may or may not be solid evolutionary reasons behind this but, in the context of most modern work, this character trait is more curse than blessing. The internet itself is also a near perfect distraction engine and, if any part of your job at all involves being online, that temptation is never more than a click away. 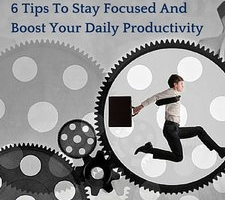 Productivity requires focus and focus requires narrowing your attention down to a single point. In order to actually do this, you simply cannot tolerate unnecessary distractions in your environment. If this is an area you struggle with, you need to look the situation in the eye and take some adult decisions. You either have time to spare for spending on distractions such as Facebook or you don't. There is no middle ground. 5. Systems, Systems, Systems One of the classic signs of disorganised, unproductive people is that they lack systems in their lives. Rather than following a series of defined steps when tackling a task, they tend to just muddle through and hope for the best. The problems with taking this sort of ad hoc approach to most tasks are legion. First of all, a lot of precious time is wasted trying to reinvent the wheel, or coming up with solutions from scratch for what are, more often than not, solved issues. The second problem is that there is virtually no room for iterative improvement in any kind of repeated task without following a system. By definition, a system can be tweaked and refined over time and in doing so it naturally improves. Fail to systematise and you throw away this potential upside from the outset. The final point is that lack of a system means you are condemned to carry out the task yourself for the foreseeable future. Having a system in place opens the door to being able to delegate future responsibility in a safe way and possibly scale its implementation. 6. Know What's Important In Advance Before you sit down to work each day, before you pick up a phone or open a browser tab, you should be crystal clear about what the three most important tasks of your day are. The best time to make this list is the day before you actually plan on carrying out the tasks. By singling out your priorities for the day before anyone has had a chance to interject their own into the mix, you maintain clarity, focus and momentum and significantly improve your chances of actually finishing important work. This small actionable list also gives you a bulwark against ending up in an unproductive muddle by mindlessly reacting to whatever crosses your plate during the day. You can assess any incoming data in the context of an already defined set of priorities and make informed decisions as a result. The six tips we've discussed above are simple concepts on paper but putting them into practice on a daily basis takes time and real perseverance. The rewards on offer are enormous though. Stick to these principles over time and your productivity is sure to skyrocket! What does this title make you feel? If you are a stay-at-home parent planning to start a small business, it is normal to fear and feel a sickening in your stomach -- thinking this is near impossible. Looking after the kids alone is a full-time job (I have been there). You have very little time, let alone the money to start or run a small business while you live on one wage and struggle to pay the mortgage/rent, cars, bills and feed the family So I guess the title is unrealistic right? Wrong. It all comes down to what kind of small business we are talking about. Many home parents try to do something on the side like create crafty projects or sell unique products to their friends or parent’s group. It only costs them a few hundred for materials and their group will support them. It will only take an hour a day and they can do it while the kids are asleep or while they are out being social with the group. But realistically, you would be lucky if you could make $100 per week. Most will only make around $20 per week. Simply because this is a hobby and not a business. Another issue is that there is only so much your clientele will buy of these types of products, so the “business” will usually phase out as quickly as it started. We need a “real” business. However, most start-ups cost an average of $500,000 to get going. Who has that kind of money lying around? Ok, you may be able to mortgage the house but do you want that risk on your family? It’s a huge debt to have and the stress will cause a lot of issues. Also, more than 80% of businesses fail within the first 3-5 years. It is a huge gamble. So to reduce the risk, we can buy a franchise right? Yeah Ok, you probably looking at more money again, and then after you pay the franchisor plus all the other expenses, it may not be worth your time right now. I’m not saying these are bad business ideas, I just think the timing is what needs to be looked at. We have a normal family situation -- a couple in their first home (be it rented or mortgaged), 1 parent working and one looking after the 1-2 kids with lots of bills to pay and facing so much stress. We need a profitable business that doesn’t cost a heap to start, can be done in a few hours a week, and has minimal risk. Most of all, it should be simple and easy to do. Correct? Direct Selling, Word of Mouth Marketing, or Network Marketing? Remember the Tupperware parties, Avon Calling and so on. Things are very different these days with the use of technology and understanding of the past. Gone were the days of cold calling and door to door sales. Today it’s called referral marketing. You simply recommend a friend to see a product or business you have had results with, and that’s that. No holding / delivering stock, no parties, no worries. This profession has been around for over 100 years this is why it is so successful and people such as Richard Branson and Donald Trump applaud Network Marketing. Here are some reasons why: 1) It requires very little capital but high return. 2) Anyone can do it regardless of their background and education. 3) You can be working in your spare time, around the kiddies. 4) There is virtually no risk. 5) There is sure to be a product / company that you are passionate about. This profession offers it all. However, the reason so many people pass it by is because it either feels too good to be true, or they have a bad perception of the profession due to a past experience or something they have heard. There are more than 250 companies running at the moment, some huge companies such as Amway have been around for more than 50 years. How does a stay-at-home parent get started? Simply find a product/company that you are passionate about and do your due diligence. Ask around, talk to your friends. I am sure you will find a few. Once you have found one, you could get going in under an hour, to join the business you will usually pay a couple of hundred dollars, up to a few thousand for a yearly plan. For this cost, you will be purchasing products to use and promote (a legal requirement of this profession). The ordering process these days is automated so the products will be delivered to your door by postal or courier service. All you have to do now is try the products, feel the results and tell the world about them. Have you ever recommended a good movie or restaurant to a friend? Well this is the same thing, though if they did go online and purchase, you get paid!! Most companies offer a free website to refer customers to. They will give full training and support, as well as, marketing materials and so on. Many will usually have physical offices and locations to use for events also. So there is no need to open your home. If you are unsure about anything, a leader will step in and assist you. They will help you succeed and you will create a new social circle and have fun doing it. Most companies also have a varied compensation plan, so you can work on the payments types that suit you. All you need to do is enjoy the products and share what you like about them. This business can quickly build a great income that can pay you over and over again without needing to make connections (this is residual income and means that if a customer likes the product, they will repeat purchase). Your business could even branch overseas and you can get paid while you sleep! I have seen stay at home parents make so much money, that both of them retired from their “normal” work. It takes a little effort, but will quickly build to be very profitable. I am reminded of a couple I had met and I’d like to share their story here. This man was an Engineer for a very large company during the dot com boom. He was offered a very good role in the Silicon Valley and so moved his wife and 2 boys to the USA and worked for 3 years. He enjoyed a great income until things started to get shaky and the “dot com bubble burst!” As he puts it. He laid off 200 of his staff and felt terrible. Making him physically sick and hating his job. The family returned to Australia and he still worked for the company but with a greatly reduced salary. His wife, just before leaving the USA met a woman in Network Marketing and decided to give it a go. The husband was very against it but said “do what you like Honey -- after all, a happy wife makes a happy life.” After a few months, she showed him her commission cheque and it matched his for the month. A few months later, she showed him another, significantly larger cheque and the husband said “wow, that’s what you earned last month?” to which she replied “no darling, that’s what I earned last week!” The husband decided to then take Network Marketing seriously. They both now “work” full time in the profession earning over $3 million per annum. This couple and their two boys live in a beautiful home on Queensland’s Gold Coast, living a life traveling the world and enjoying things most can only dream of. They created this life in 4 years and I am proud to say, they are part of my team. In closing, I’d would like to say that yes, there is an ideal business that is well suited to stay at home parents. It is not your regular business type, it’s much better. You just need to take the time to look into this with an open mind and see if this is for you. It is better to say “no” to something you understand than to blindly miss it entirely. This is a question I pondered today as my husband and I sit over our computers, run in and out of the house and try and meet all the deadlines. Scheduled into my day is time for my child, time to work, time to cook and time to clean but what about me time.... It sounds funny to say that we need to schedule me time but we do we need to allow time for us to be in our days and it is not or no longer should be at Work at Home myth so how do we do it. Prioritise your life It is essential that you spend some time reflecting on all that you are doing. In the midst of not even having enough time to sit down for a cup of coffee, making time to reflect can seem like a big evil monster waiting under the bed. However it is not that scary and what you will find is a cute fluffy rabbit when we end. Look carefully at all of the things you are currently doing and determine which are the most important. Look at what is important to you as well as your business and family. It is time to create order to figure out which things you really must do now, which things can wait and which things you can let go of (scary thought you can you know) Combine tasks to get some me and family time: Some of your many tasks can be combined. Taking a walk with baby (and partner?) after work will give you some time together and also a chance to stretch and exercise. You can provide a safe place on the floor in the kitchen for your child to play, observe and talk with you while you are fixing dinner. Taking a bath together is one way some families enjoy time together. Sometimes the activities will take longer, doing them together, but will be well worth the effort. Simplify Things A baby is only a baby for one time which means, your house will be a mess, people will come over unannounced and your baby will want to spend time with you Spend time with your baby. Clear a path through your house so you can get on the floor and hang-out and enjoy your baby. It is amazing how blocks can be such a stress reliever. You build you achieve, baby tears it down and you laugh! Very simple, nutritious meals can be thrown together quickly. Sandwiches, smoothies, quesadillas, there are many options for 15 minutes or under dinner prep.Remember being a work at home Mum is a Balancing Act. We may never find a moment in we feel perfectly caught up on all the things they expect that we should do. If you consider this a normal state you can learn to relax about it. Balance isn't something you necessarily find as a parent, it is something you are always moving towards. One week you will get lots of good things done at work and the house will be a wreck. Balance doesn't happen in any one instant, but it can happen in the long run. The most important thing is that Me Time and Family Time do exist for the Work at Home Mum. ​ Here are ways how SMB’s can use SEO even on a budget. Virtually every aspect of life has been connected to the internet in one form or another, and everyone from your grandmother to your customer is online too. Some people have even made it a goal to never even leave the house for the things that they need, from groceries to grenades – it can all be purchased online. This means that all businesses need to be online too, and to succeed they need forward thinking SEO specialists that will maximize their online potential, exposure and authority to reach the largest audience possible while making the most impact with every dollar. The days when a local small business could trust in a yellow pages ad as the sole marketing drive are long gone because search engines have replaced them. Even businesses that rely heavily on word of mouth can get more traction from that conversation when it’s being shared online in social media or even just a blog than they can when it is person to person. In a time when being in business means having a website, any small business that doesn’t take advantage of basic SEO practices will only be prolonging their inevitable failure. 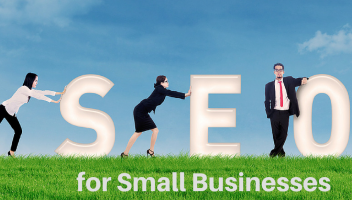 How Do Small Businesses Use SEO? In keeping with the Yellow Pages theme, there were companies that tried to be at the front of certain category sections by making their business name “AAA Auto repair” or the like, and this worked because of the way that the Yellow Pages were set up. Today search engines work in a very similar way in that an SEO specialist can do the equivalent of renaming your business to AAA-whatever without having to actually do so. Even business owners with no training, and the most basic understanding of language can still take advantage of a number of tips and tricks to rank higher, gain more traffic, and convert more looks to leads than if they simply did nothing at all. By creating targeted and worthy social signals, content optimization, and backlink building any small business can be at the top of a search results page, and convert website visitors into customers at a much lower investment than would be required through a brick and mortar transaction. Some of these may sound like scary concepts or unattainable goals, but nothing happens overnight, and all of these tactics are easily manageable with a bit of research and some hard work. What Tactics are Best? While the jury is still out on how much social networking matters for website optimization, it is positively clear that it definitely has some effect, and even if it didn’t social media is still a great way to connect with and tune into a small business customer base. Crafting a social media campaign gets easier the more time you put into it. Some small businesses after setting up a Facebook page may be daunted by the challenge of constantly providing content, gaining friends, likes, shares and all the other dazzling options that social sites have, but to be sure, the more you invest in this activity as a regular part of business, the more business you’ll have to discuss and it becomes a cycle of success that gets easier and easier. For social campaigns and small businesses, the best method is usually to set up a schedule for posting the way you would set up a time to do an estimate, or do accounting. Once the task becomes regular, it becomes less of a chore and more of an escape from things like accounting. Creating great content for your website is a combination of writing for the search engine bots and the people that will come to your site for information. The trick is to walk the thin line that separates authoritative search engine writing with the user friendly experience that you want to give to each potential customer. There are a number of keyword tools that can aide in this project and even Google itself can be a source for solutions with the combined experiences of everyone else who has gone before you. Crafting the language for your site may at first seem a challenge, but a safe rule of thumb is to assume that if it explains your business and hits on a number of the ways that search engines view information like the keywords that your business uses, then you’ll be off to a good start. Backlink building is when you get other websites to link to your website. It’s that easy really, but the best practices when it comes to backlink building involve making sure that the links pointing to your site are from reputable sources that lend authority to your site as a whole. Think of backlink building as having friends and family vouch for your products or services only instead of people doing it in a word of mouth format, you instead get the search engines to do it for your website as a whole. Where to Start? The best place to start with any SEO endeavor is wherever you are most comfortable. Any positive changes will result in positive feedback, and that in turn will provide confidence to try more, and make the website better, stronger, faster and capable of reaching more people and thus converting more customers. Many people start out with the social media aspect of SEO practices because it is the most fun, and they are already comfortable with the interface. But in truth, it doesn’t matter where a small business starts with SEO as long as some effort is made somewhere, because businesses that procrastinate won’t have too many more chances to reach customers in a world that is driving forward digitally with or without them!